Zach Gilford (born January 14, 1982) is an American actor best known for his role as Matt Saracen on the NBC television series Friday Night Lights. 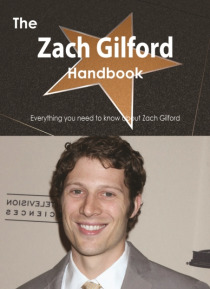 This book is your ultimate resource for Zach Gilford. Here you will find the most up-to-date information, photos, and much more. In easy to read chapters, with extensive references and links to get you to know all there is to know about Zach Gilfor… d's Early life, Career and Personal life right away. A quick look inside: Zach Gilford, Answers to Nothing (film), Dare (film), Friday Night Lights (TV series), Kiele Sanchez, Matt Saracen, Michael Keaton, Northwestern University, Off the Map (TV series), Ours (song), Post Grad, Super (2010 American film), The Last Stand (2013 film), The Mob Doctor 81and more pages!Contains selected content from the highest rated entries, typeset, printed and shipped, combining the advantages of up-to-date and in-depth knowledge with the convenience of printed books. A portion of the proceeds of each book will be donated to the Wikimedia Foundation to support their mission.